Washington Dulles Intl. - Owen Roberts Intl. Ronald Reagan Washington National - Owen Roberts Intl. Very relaxing and staff very nice. Beach behind hotel doesnt look like the picture online Main pool with swim up bar could be kept up better and also hot tub. 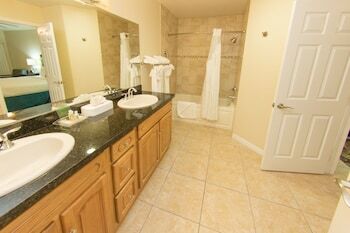 Great little hotel that is a few minutes walk from the beach with access to all Westin amenities. 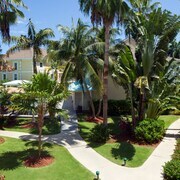 There is no ocean view from the property but with access to the Westin it is so worth it! It certainly isn't the Westin but, you're probably not spending much time in the room anyway, right? Great hotel! Excellent staff. Only down side was the shower would not keep a constant temperature. Everything else’s was great! Nice location, lovely lobby, resort fee too much for things not used much. Nice, new hotel close to the beach. Very accommodating with reservations and trips. 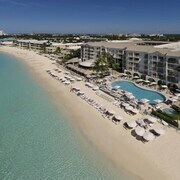 Situated in Seven Mile Beach, this condo resort is within 1 mi (2 km) of Governor's Beach and Camana Bay. Port of Georgetown is 2.9 mi (4.7 km) away. Honeymoon Great location! Slow more private beach but yet close to anything you want to see. Close to many locations to eat and the grocery store. Super clean, super nice and very close to the water. I have nothing really bad to say about the location, the beach, or the trip! Proud cheapsters — are you ready to live big on a budget in Seven Mile Beach? Where is Seven Mile Beach? 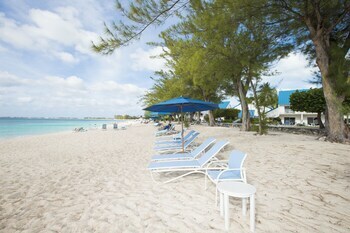 Seven Mile Beach is located about 3 miles from George Town and 3 miles from West Bay. Hotels and flights booked — check! Bags packed — check! 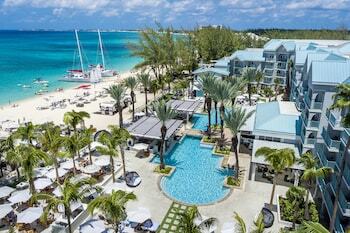 Itinerary filled with free experiences in or near Seven Mile Beach — you know it! Our list below will help ensure that your vacation is as gentle as possible on your cheque book. Whether you want to escape a rainstorm or work out your brain, you'll just adore the Georgetown Museum, the Cayman Motor Museum and the Cayman Islands National Museum. And don't forget — these places don't charge entry fees! A lot of entry fees are pricey and all the art is behind glass — but there are alternatives. The National Gallery of the Cayman Islands and the Pure Art Gallery are well known for curating widely accessible events that are free to attend — why not check out their programs? Penny-pinching history enthusiasts must add Fort George and the Peace Memorial and Clock Tower to their vacation to-do lists. These historic sites also offer superb photo opportunities! The spirit of a place is often found on the street level. Take a walk around Camana Bay to see what we're on about. There's nothing like the tranquillity of a holy structure. See if you can tour the halls of St. Ignatius Catholic Church to learn a little more about the area's religious side. Don't stress out about sifting through the web for the best deals on hotels, travel and vacation experiences. CheapTickets has figured it all out for you, and we certainly haven't made any trade-offs on comfort or convenience. Some might think traveling on a budget means limited choices, but with us it's quite the opposite. With 500 partner airlines and over 500,000 properties across the globe, you'll have all the choice in the world. 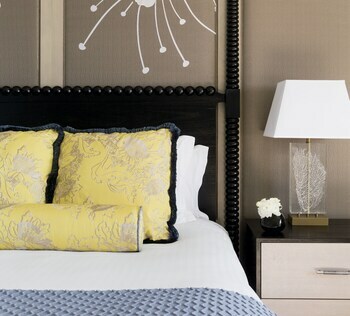 And when you combine your bookings on hotels and flights, you could save up to $481. What about this for putting your mind at ease? If you find your package for less within 48 hours, we can match that price and reimburse the difference. That's our Price Guarantee. Book a flight, earn CheapCash and use it to help pay for your next eligible CheapTickets hotel booking. Our rewards program is that straightforward. So, what are you waiting around for? You're only a few steps away from collecting savings on all eligible flights! Just log in to your account or sign up for a new one for free, join our CheapCash loyalty program, and you'll also be the first to know about penny-pinching perks and super-thrifty bonus offers! We hear you — you've already splashed out enough of your hard-earned savings on your escape, so you certainly don't want to be forking out for taxis. 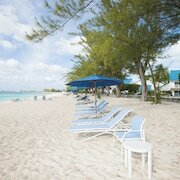 Luckily for you, Seven Mile Beach has some good car rental outlets which should ease the load on your wallet. As soon as the wheels hit the tarmac, head on over to rent a car right at Owen Roberts International Airport. Why not let the friendly people at Fox Rental Cars and Hertz help out? You might also think about Budget and Dollar Rent A Car. Hertz is situated in the middle of town at 18 Palm Heights Drive. If you plan to stay nearby, this is a great place to go. Get in quickly for the cheapest deals. 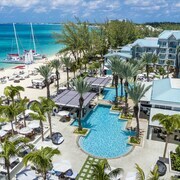 CheapTickets currently has 30 hotels in Seven Mile Beach. Can't make up your mind where to book? 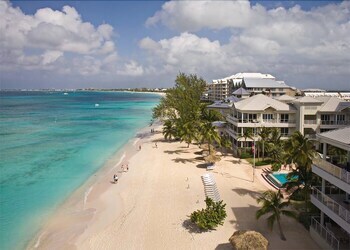 A few top options include the Caribbean Club Luxury Condo Hotel and The Ritz-Carlton, Grand Cayman.